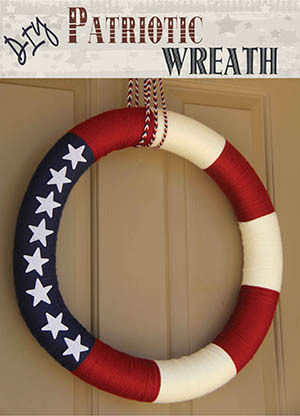 12 Beautiful Patriotic Wreaths You Can Make Today! If you haven't made a Patriotic Wreath yet, scroll through all of the beautiful ones below. 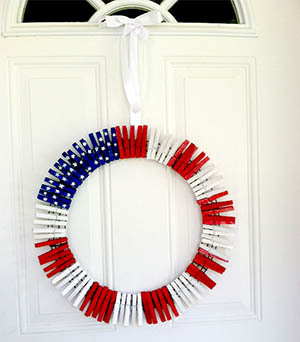 Beautiful red, white and blue hanging from your front door! 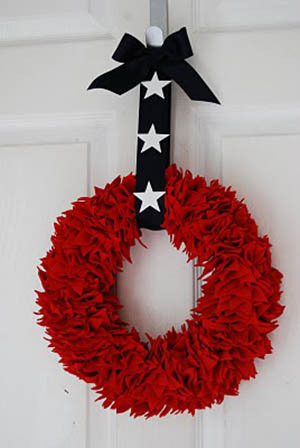 You could easily make this in a few hours and feel the pride of the USA! Great 4th of July decorations! This is a version of the popular mesh wreath and it is absoluely gorgous! There are so many more for you to look at! Keep scrolling down and look at all of them before you decide which one you will make. WARNING: It won't be easy to decide! 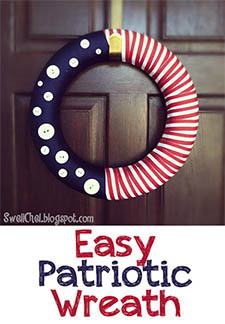 How elagant is this patriotic wreath? You could even reverse the colors if you wanted. I can see the blue with strars on the botton and a red striped ribbon for the hanger, what about you? What can you see? I can see this as part of my 4th of July decorations. 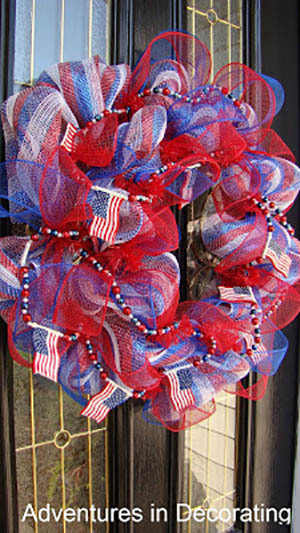 Flashy is all I can say about this patriotic wreath... It is the essence of the 4th of July. Red, white and blue with stars. This one have a very modern feel and I absoluely love it and I think I will be making this one. It's not just modern... but it's easy to make. 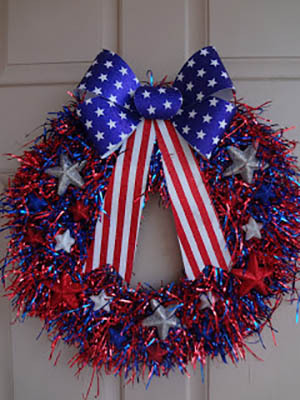 This Patriotic Wreath is adorable it does give off a love for the United States. 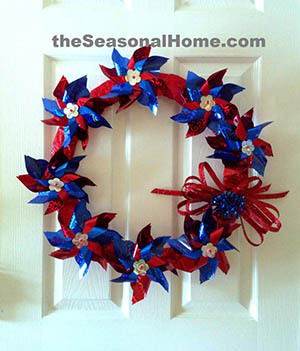 How fun would it be to have this pinwheel patriotic wreath hanging on the front door? 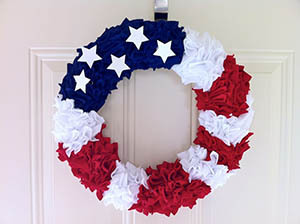 I think this would be a great wreath to hang inside as well. 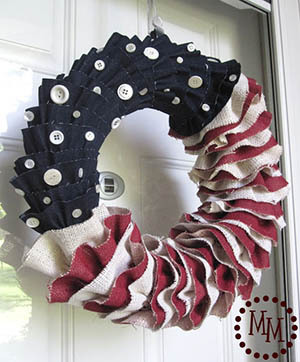 I love the look of this clothes pin wreath. Grab yourself a couple bags of cloes pins and som paint and go to town making this. 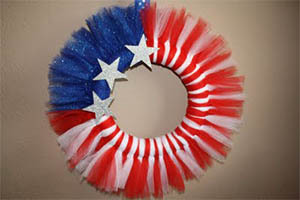 Here is a Tulle Wreath that will have your neibors starring and wondering where you bought it. Wouldn't it be so much fun to see their faces when you tell them you made it yourself? 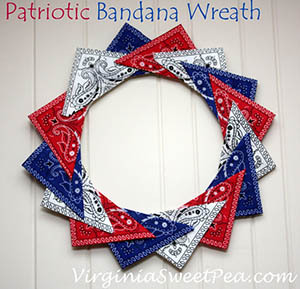 Who would have thought we could make an exceptional 4th of July decorations from bandanas? Other ideas might pop into your head with this one! Here is another of my favorites. It's very pretty, but very easy to make and there's a little secret involving this one. I love this Burlap & Denim Ruffled beauty. It has a country feel and I love the ruffled look it has. 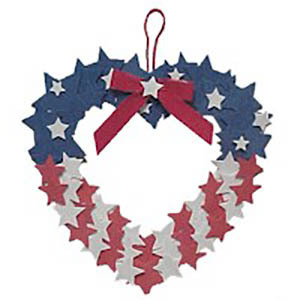 Share a Patriotic Wreath with your Facebook friends!